When my wife and I review our retirement accounts and plan how much we need to save to have a good retirement in our Golden Years, we always use the assumption that Social Security will not be there and available to us when we retire. We have decades left to go before we are eligible to retire and draw Social Security benefits in our sixties. That is a very long time, and the system is in trouble now. 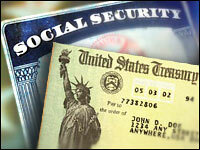 It is no real secret that the Social Security system is in trouble. Experts have been preaching their doomsday sermon for years that the Social Security Trust Fund will soon run out of money. Many pundits and politicians say that the Social Security is too big to fail and too much of a political hot button topic to not be available decades from now in some form. But, things have to change. Benefits will have to be decreased, the retirement age will have to increase, or both will have to happen in order for the system to survive. The system in its current form is unsustainable, and that is why I always use the assumption that it will not be there for my own retirement despite paying into the system. Social Security, which was founded in 1935, is a pay as you go system thanks to the Baby Boomers. The taxes that current workers like me are paying into the system is paying the retirement benefits of the current retirees like my parents. The trick is that we need to have more children ourselves so that they will literally take care of us in our old age. Experts say that the Social Security Trust Fund will most likely be out of money in 2041 just as today’s twenty year-olds begin to retire. So, the moral of the story is to invest on your own through your Roth IRAs, Thrift Savings Plan (TSP), or civilian 401-k’s as much as you can. Do not count on the federal government for any help in preparing your finances for retirement. You are in charge of your own life and your own destiny. Not one cares more about your financial future than you…especially Washington. I found a great blog posting at Benefitsblog with some interesting statistics. A survey conducted by Sun Life found that 48% of Americans would prefer to stop paying into the Social Security system altogether. 70% of workers in their 30’s and 66% in their 40’s do not believe Social Security will be available at all to draw from when they are 67. You left out a third option for the Fund to remain intact: raising the Social Security Tax. I think this would be the most likely scenario to happen, rather than decreasing benefits (retired Americans are a huge voting bloc), or increasing the age (65 or earlier seems pretty ingrained into our society). I’m a 20-something Canadian, but in talking to friends and relatives (Canadian and American), I’m shocked at how many people think Social Security (or for us Social Insurance) will help them retire (although it’s a thankfully dwindling number). I’m also an advocate of assuming a zero support level from the government. It’s unfortunate how many characteristics of our social programs are similar to Ponzi schemes: In order for the system to work, there needs to be more people entering the system than people withdrawing funds. With the declining population, not only are we not going to have similar support levels as our previous generation, but things will get significantly worse! Good “Moral of the Story”, and a great lesson: plan your own retirement and START EARLY! Whats the point for the younger generation to pay social security to all the baby boomers when we get nothing from it by the time we’re eligible? Personally i dont want to pay for em, maybe im an awful person but why do i have to take the brunt of the tax to income when im trying to start a family and and barely make rent while all the retirees actually have the majority of the wealth in the country. I would like to see an option where we can withdraw from paying social security fully knowing we will not be able to use it, something you would see and sign off on such as when you sign in on your income tax bracket. Andrea – I think that you and I and everyone else out there is stuck since it is the current law, right, wrong, or indifferent. I would just remind you that our Baby Boomer parents fall in the same boat we do though. They paid for the original recipients to receive a benefit, and now we are doing the same. The problem with withdrawing from the system completely is that it runs at a deficit….kind of like a Ponzi Scheme. The current workers pay for the retirees. We are one generation behind. So, just allowing young workers to quit is not feasible. Social Security will be there when our generation needs it. It will just look different, with an older withdrawal age, and reduced benefits. Next post: Buying Only American Goods Costs You Money – Buy The Best!